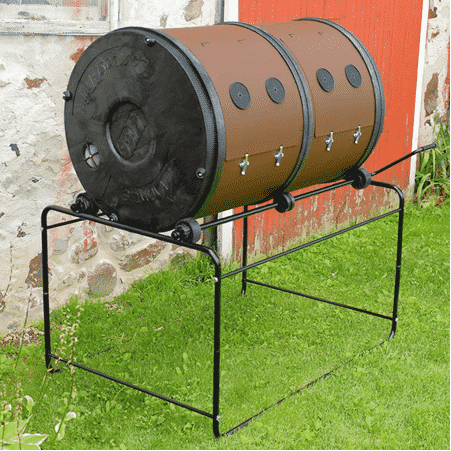 Compost Twin by Schiller Grounds Care Review: Is It a Good Tumbler? It is a good thing that more and more people are becoming concerned about the environment and what happens to their waste products. It is now common for people to have compost bins, not just for the overall environmental benefit of being able to reduce waste, but also because people understand how beneficial it is for their own lawn and garden. A lot of information is now available on both recycling and on composting, and the result is that there has been a significant decrease in the amount of average household waste. If you have just started to compost, you may have many questions. Exactly what you can and cannot put in the compost, for instance, is a major issue that people often have come across. As a simple rule of thumb, anything natural and uncooked (so things like peels, vegetables, etc) can be composted. The second question you are likely to have is which compost bin to use. There are many different shapes, forms, and methods of composting, one of which is the Compost Twin by Schiller Grounds Care. This product has two chambers, which means that you can leave one chamber to compost, while you continue to add yard waste and scraps to the other. In total, it can hold nearly 25 cubic feet of raw material, which is the equivalent of around 30 gallon trash bags, per chamber. The composter has a sturdy construction, being made of galvanized sheet metal with a powder coated steel frame. It also has a range of smart features that make it very user friendly. Thanks to these features and ease of use, it provides high quality soil. The tumbler comes with cleverly placed vents so that oxygen can enter the chamber with ease. Airflow and drainage are both even and proper, which is critical when you want to create good quality soil. Furthermore, inside the bin, there are fins that help to aerate and mix the material whenever you rotate it. The bins, meanwhile, are enclosed, which stops rodents from coming in, as well as other wildlife. At the same time, it is visually attractive, particularly compared to compost piles. Furthermore, becomes the drums are enclosed and the process of composting is so efficient, odors are virtually eliminated, something your neighbors will thank you for. At 32” in height, it is very easy to load and unload the bin as well. And, thanks to the gear mechanism and easy crank handle, it is very easy to turn a drum, even if it is filled to capacity. The product is highly priced. However, it is a top quality composter with a wealth of extremely positive reviews. People often state that it composts so quickly, that it looks good, and that it is so easy to use. Capacity - The composter has a very large capacity. Each of the two drums can hold as much as 25 cubic feet of raw material, which means you can use two drums at the same time as well. Quality - Schiller Grounds Work have really focused on the quality of their product with this composter. Made from galvanized steel, the bin will last a lifetime, even if it is exposed to various weather extremes. User Friendly - It is very user friendly, requiring only someone to turn the bin regularly. It includes features such as strategically placed vents and an easy to use turning handle, which enables people to rotate their soil, creating a high quality mixture, every day. Looks Good - It is an attractive composter, which is something that really sets the device apart. With its two chambers, vents, and brown color, people are likely to see it and comment on it. Fast Composting Time - The double drums and easy tumbling of the mixture allow overall composting time to be greatly reduced. Cost - Unfortunately, it is certainly not the cheapest on the market. That said, its durability and large capacity means that it does offer fantastic value for money. Is The Compost Twin Right For Me? Experienced composters with quite extensive waste production, such as families with two children. People with mobility or strength issues, or those who live alone. When composting, you are doing the world a tremendous favor. You will drastically lower the amount of waste that has to end up in landfill sites by reusing those that you have left over after you prepared a meal. Composting is a form of recycling and one that pays off immediately because you can use the compost to fertilize your own garden. Additionally, you can compost many different products, including most of your own garden waste, which means that weeding is no longer something to put off and see as a chore. Rather, you will be creating nutrient rich organic soil that can help improve the earth’s overall health and well-being.